The specimen shown above was photographed in the Lot Valley, southern France, in late May. 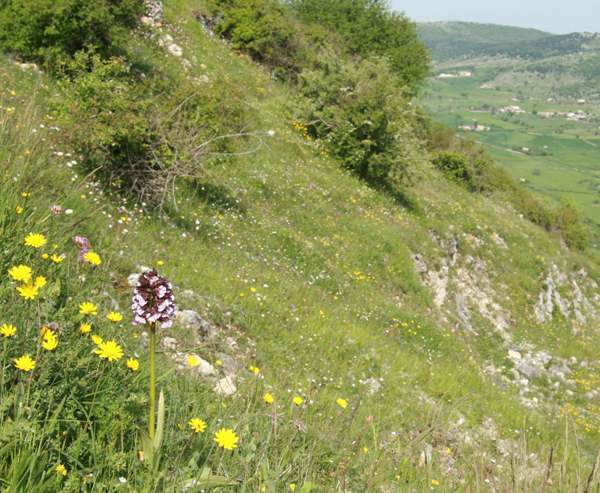 It is easier to find this orchid in France or Italy where it still flowers freely in some places. 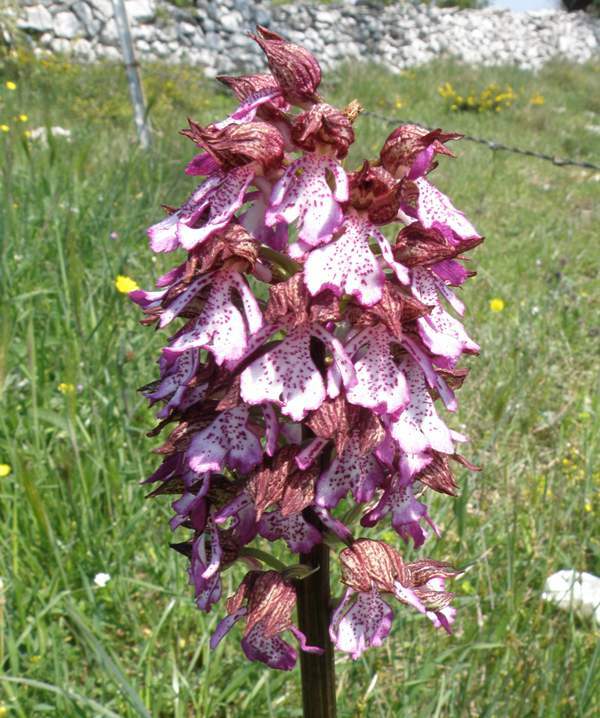 In the Gargano Peninsula area of southern Italy the plants can grow to a metre in height and have large, densley-packed infloresences of vividly marked flowers. The Lady Orchid grows up to 80 cm tall and has a basal rosette 3 - 8 large erect leaves which are glossy green and unmarked. The flower spikes of the Lady Orchid can contain anything up to 200 individual flowers. The upper sepals and petals from a dark red hood above the lip of the flower which is white and strongly marked with deep red. The shape and markings of the lips of Orchis purpurea are extremely variable but there is no mistaking a Lady Orchid when you have found one - its sheer size and vivid white and dark red flowers confirm that it is unlikely to be anything else. 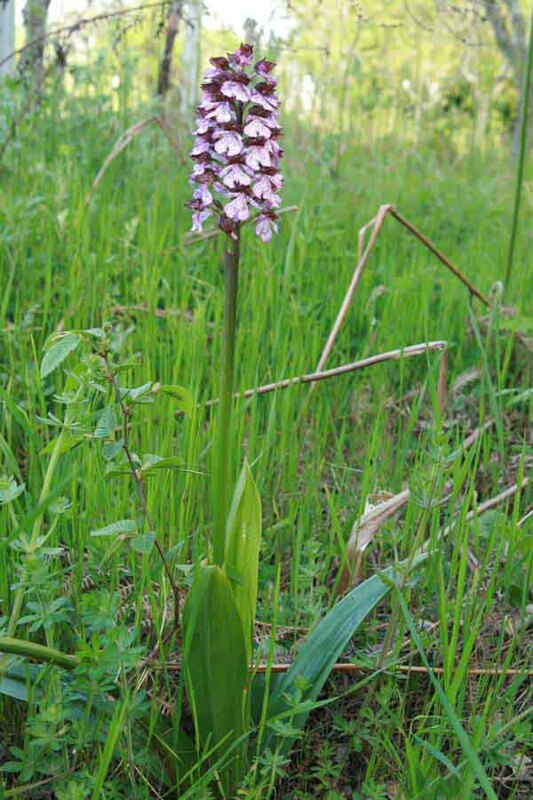 The Lady Orchid is now rare in the UK and found in only a few sites in Kent and Oxfordshire. It is more common in parts of Europe where it occurs from Denmark in the north to Spain, Italy, Greece and North Africa. 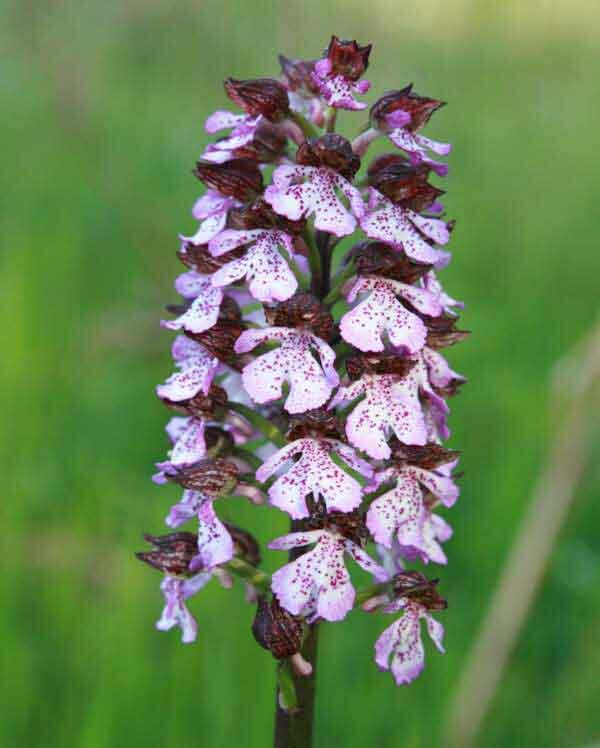 Favouring alkaline or occasionally neutral soils, the Lady Orchid occurs in short grassland, on woodland edges and sometimes in open woodland. In the UK it associated almost exclusively with woodland habitats, but is found in open scrubland in other parts of Europe. The plant shown above was photographed in mid-April on a roadside in southern Italy, and there were numerous other specimens of similar stature in the vicinity. In the UK this orchid flowers in May and June. Further south in Europe it comes into flower in April.